Estimating the values of dispersion and biochemical reaction rates of heterogeneous aquifers is critical to predicting the temporal evolution and fate of reactive solutes. 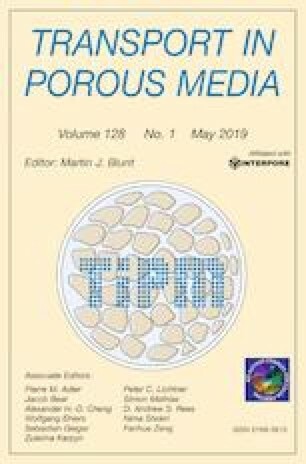 While previous studies have investigated field-scale heterogeneity of transport and biochemical properties of porous media, effects of local dispersion have not been well understood. In this paper, longitudinal macro-dispersivity, effective decay rate, and effective solute velocity are derived for a stratified aquifer, and the effects of local dispersion, especially the local transverse dispersion, are studied. It is shown that the inclusion of local transverse dispersion leads to enlarged effective decay rate, and that ignoring it may significantly underestimate the effective rate. The Damkohler (Da) number and the coefficient of variation (CV) of decay rate have slight influence to macro-coefficients under very small Pe number (with large local transverse dispersion). However, Da number has growing effect on the asymptotic effective decay rate with the decrease in Pe number, and results in constant asymptotic values regardless of Da number under the condition with very large Pe number. Larger CV of decay rate leads to smaller effective decay rate and effective velocity, and longitudinal macro-coefficient. The longitudinal macro-dispersivity is found to depend on the correlation between the hydraulic conductivity and the decay rate if the local longitudinal dispersion is spatially variable. This study was supported by the Natural Science Foundation of China Grant 51522904 and the National Natural Science Foundation of China Grants 51479144 and 51629901. The third author acknowledges the support by NSFC Grants 51609173 and 51779179. The last author was supported by National Science Foundation Grant EAR-1552329. The integral can be numerically evaluated. The partial correlation residual \(\delta \) is assumed to be a statistically homogeneous random field (Miralles-Wilhelm and Gelhar 1996).